• Be a citizen of Sri Lanka. • For the LLB Degree Programme, candidates with GCE A/L, London A/L or any other equivalent foreign examination results obtained in any year can apply. • Have a minimum of three Simple (S) passes at the GCE (A/L) examination in the relevant stream and be qualified for university admission, or possess an equivalent qualification in London A/Ls (Cambridge or Edexcel) or in any other equivalent foreign examination. • Have a Credit (C)pass or above for Sinhala/Tamil and English Languages at GCE (OIL) examination or a Credit (C) pass or above for English Language in London O/Ls or in any other equivalent foreign examination for LLB Degree Programme. • Have a Credit (C) pass or above for English Langüàgc at GCE (O/L) examination or a Credit (C)pass or above for English Language in London O/Ls or in any other equivalent ti.reign examination for other Degree Programmes. • Candidates who apply with High School Diplomas should have passes in SAT and TOFEL with a minimum score of 550 or IELTS with a minimum score of 6.5. 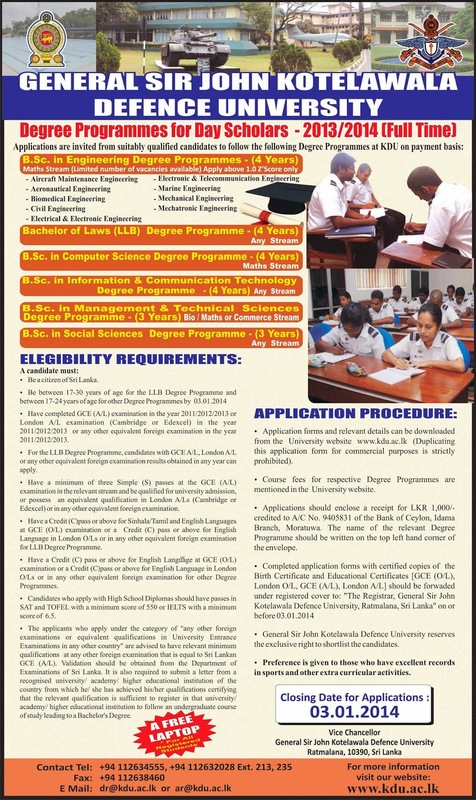 • The applicants who apply under the category of “any other foreign examinations or equivalent qualifications in University Entrance Examinations in any other country” are advised to have relevant minimum qualifications at any other foreign examination that is equal to Sri Lankan GCE (A/L). Validation should be obtained from the Department of Examinations of Sri Lanka. It is also required to submit a letter from a recognized university! academy! higher educational institution of the country from which he! she has achieved his/her qualifications certifying that the relevant qualification is sufficient to register in that university! academy! higher educational institution to follow an undergraduate course of study leading to a Bachelor’s Degree. • Application forms and relevant details can be downloaded from the University website www. kdu.ac. 1k (Duplicating this application form for commercial purposes is strictly prohibited). • Course fees for respective Degree Programmes arc mentioned in the University website. • Applications should enclose a receipt for LKR 1,000/- credited to A/C No. 9405831 of the Bank of Ceylon, Idarna Branch, Moratuva. The name of the relevant Degree Programme should be written on the top left hand corner of the envelope. • General Sir John Kotelawala Defense University reserves the exclusive right to shortlist the candidates. • Preference is given to those who have excellent records in sports and other extra curricular activities.